Today’s work in progress is all about the wonky stars. When the call went out last week for more quilts to replenish the Project Linus stocks, I turned to the old faithful wonky star. 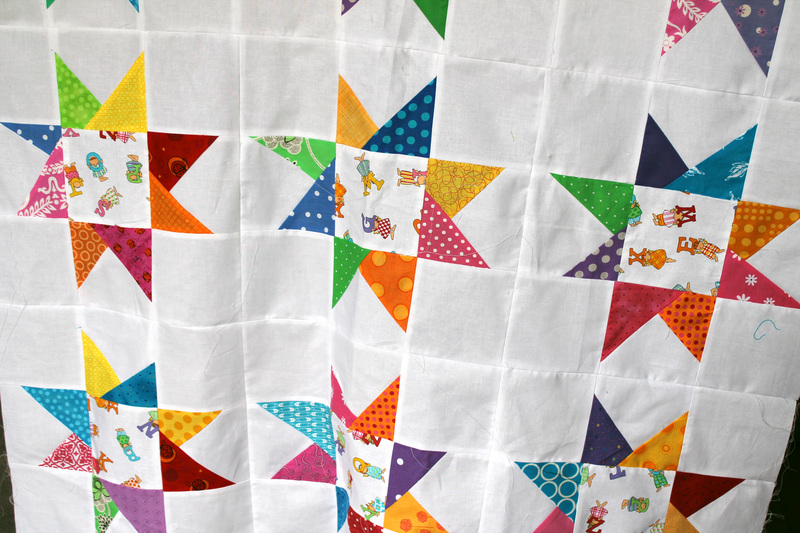 It is a fast, fun way to make simple kids quilts. I have managed to finish one quilt…. 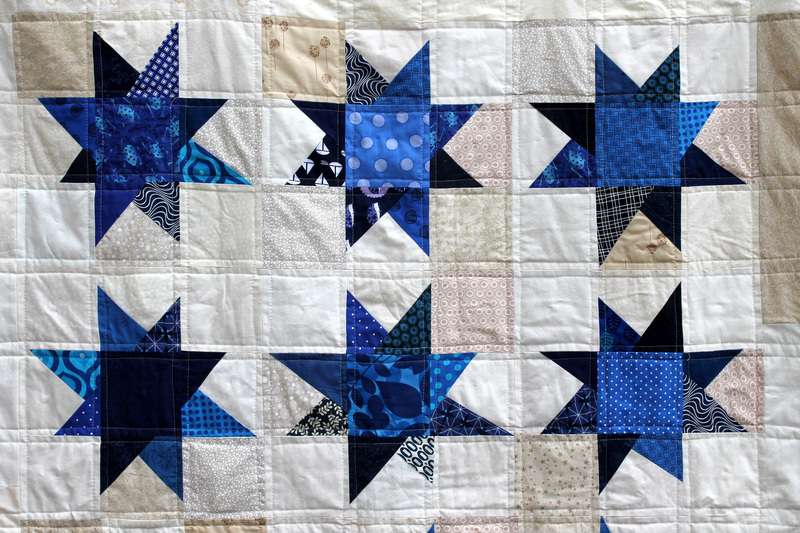 I love how the quilt turned out and in particular the scrappy nature of it. I used different white and cream blocks for the background and blues for the star. 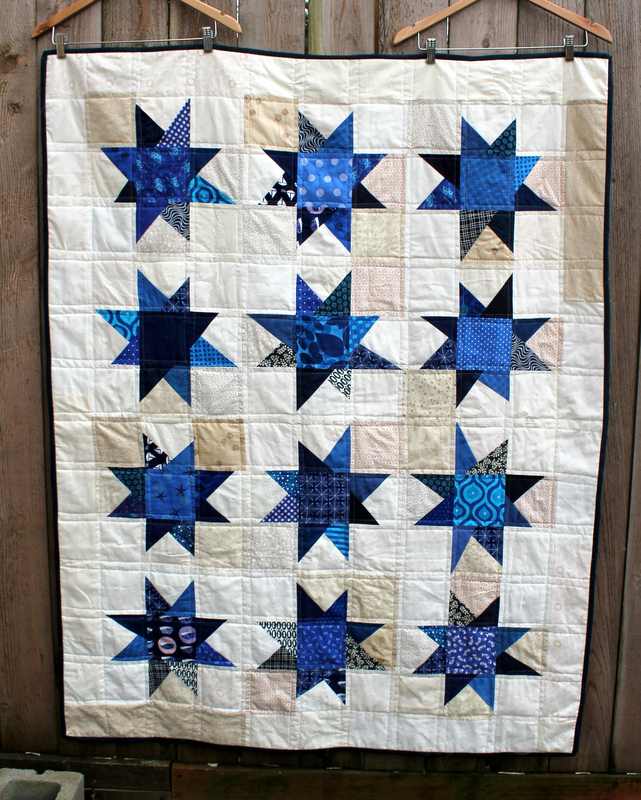 I know it should, in theory, be the other way round – blue background with white stars, but I had a stack of white/cream scraps I wanted to use up. The quilting is simple as I want to get as many of these done as I can before next weeks monthly Project Linus meeting. The quick and easy nature of the wonky star is why I choose to focus on them for this drive. I have managed to get another top done this weekend which I will try and get quilted this week. I “borrowed” the idea from another quilter I came across on the “wip Wednesday” hop. They had used a wonderful Eric Carlyle print as the center of their wonky star to great effect. I went with a Jone Hallmark kids print that had been sitting in my stash for a while. My final wonky star is currently sitting on my design floor waiting to be sewn. It is the left over star bits from a quilt I finished a couple of weeks ago. I hope to have it sewn and ready for quilting by the end of tonight, so I am going to stop blogging and go sew! I’m loving your wonky stars! All of these stars quilts are so fun!! That is just beautiful! I love it! The blue with the scrappy neutral background really works well! 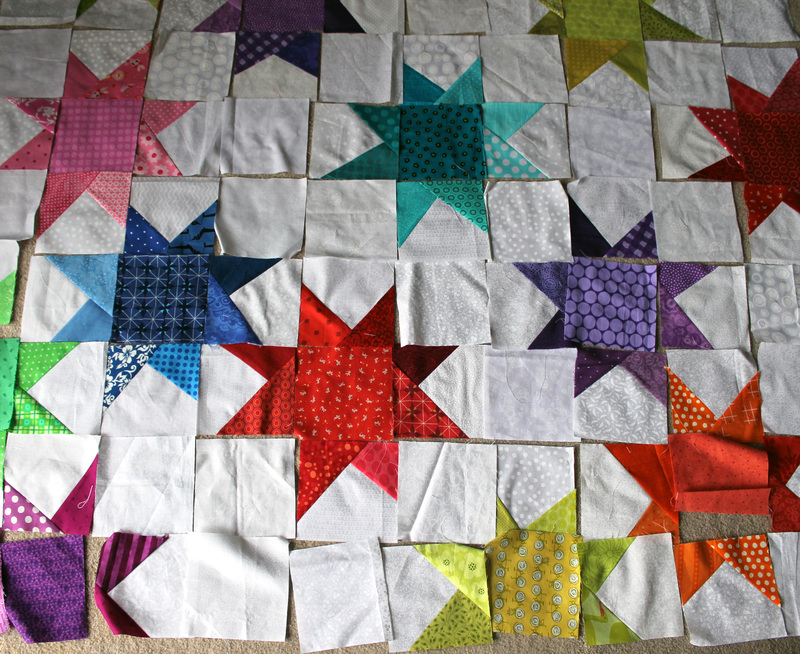 I am in the midst of making a ‘wonky star’ baby quilt myself…just waiting for some fabric in the mail so that I can finish it off! The pattern really is great for baby quilts. Please post a photo of your quilt when finished. I would love to check it out. I sure will share some photos – stay tuned! All of them are so pretty. I love the variety in the beige backgrounds for the blue and white. I love the dark blue stars! If you look at my site at the moment it may look as thought I have a star problem…. between the wonkies and the regular paper piecing Monday. I may need help! I do love wonky stars! I love your wonky stars, especially the third one where they aren’t all lined up. I love the blue stars on the cream background! Wauw, you’re productive. I always love any color combined with white. I must admit at the moment I am quilting a lot… I am not working and quilting seems like a good way to keep me out of trouble. Your wonky stars are lovely, they are all so different, and I love them all! BTW, where did you get the label made? The label is from etsy. A lovely lady called Jennifer Jewels – jennifersjewels.etsy.com. The labels were really reasonably priced and she has a few different styles to choose from. I love the wonky stars! I started making quilts, oh so many years ago, when my sister was a nurse at the local children’s hospital. Many of my quilts went to transplant kids over the years. I think it is a great idea/goal. I can highly recommend the wonky star quilt for kids. I have made so many of them over the years and it is almost a no fail pattern. You can play with the layout (on the site I have two different layouts posted – this one as well as the sparkle punch layout). I have also I am just binding another wonky star that uses the left over bits and pieces from the Sparkle punch quilt. It is a random layout which I am loving. I am also just finishing up another quick Linus quilt which is a big version of the granny block quilt. It has been really easy to make as well. Good luck with your quilt making. In the end no matter what you end up making they will love and appreciate it, I am sure. Thank you for the encouragement. Elena is nine now and at the age where the stories of her infancy and keepsakes are important to her. She came here from out of state and we only have a few items from the first year of her life. It’s hard for me to imagine that Project Linus didn’t provide her a quilt, but for whatever reason the hospital didn’t send it with her. She also has SBS, which is messy, so maybe it was stained and they thought we wouldn’t want it? The lack of baby pictures and a baby blanket from that time, the lack of something concrete that proves that someone cared, is very difficult for her. Her next two sisters also came to us from foster care and with medical challenges and we have almost everything from their time in the NICU, including blankets, so that makes it sting just a little more. I’ve only been quilting about nine months, so I’m still working in getting each of the kids a quilt and trying all the great things I see online. I keep collecting ideas though. December 2014 is her ten year transplant anniversary, so my goal is to have ten by then and a system in place to continue providing them to kids after that. Elena also feels a strong connection to kids “like her” so by then she may be old enough to be a part of the process, even if it’s just delivering them with me. It was always such a big thing for us to meet kids with successful transplants when she was struggling after her surgery (she had nine additional surgeries in the four months after the transplant). I want to provide something tangible that can be carried forward from such an intense and isolating time in the life of these kids and their families and hope. I do not the lack of time ever ends. I think the trick is to decide what you really want to do, what is important and then just do it. Have you thought about talking to your local Project Linus Chapter to see if they can help with supplying quilts. I know our chapter is very open to calls for help. Even if they can help you with just a few quilts it could ease the pressure on you to produce all the quilts. They could also help supply quilts when need for a new transplant kid, if you do not have any ready. Just a thought. Where can I get the pattern for wonky stars blocks? Sorry about the delay in responding. There is a great pdf instruction on wonky stars at http://amherstthreadtales.files.wordpress.com/2012/07/wonky-star-directions.pdf. For me, I must admit that I winged it the first time. For a wonky block I cut eight 5 inch blocks of the background fabric and five 5 inch blocks of the star fabric and went from there. Hope that helps.